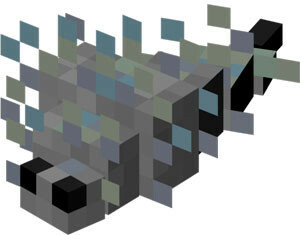 Silverfish are hostil animals that will appear when a player his a certain kind of block which is easily confused with stone. They have the apperance of an insect, an its body is silver grey and its eyes are dark. These creatures displace itself on the ground quite fast, they move its body right and left, like a snake does. Its attack is not very powerful, however they attack jumping right directly to the player, so they will push the player which sometimes can be quite dangerous. Silverifsh attack when they broke the blocks which invoke them. Silverfish appear only where are the blockes that invoke them which are identically like the sone blocks. However they last a little longer in breaking so this will give some indices to the player that a Silverfish will appear then.